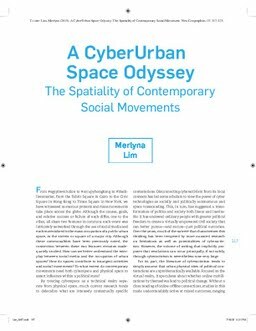 The article scrutinizes the complex entanglement of cyberurban spaces in the making and development of contemporary social movement by analyzing its imaginaries, practices, and trajectories. This issue of New Geographies, “Geographies of Information” (edited by Taraneh Meskhani & Ali Fard), presents a new set of frameworks that refrain from generalizations to highlight the many facets of the socio-technical constructions, processes, and practices that form the spaces of information and communication. In addition to Lim, contributors of the issue include prominent thinkers and scholars in various related disciplines such as Rob Kitchin (critical data), Stephen Graham (urbanism) and Malcolm McCullough (architecture/urban computing). Lim, M. (2015). A CyberUrban Space Odyssey. The Spatiality of Contemporary Social Movements. New Geographies, 07, 117–123.